Few weeks back, this article (below) was floating around the websphere and it quickly got a lot of people’s attention. I am not oblivious to the lack in awareness that is desperately needed for Sickle Cell Disease, but I was faced with another realization from the conversation this article started, and that was the lack of understanding of the severity the disease has. When people think sickle cell disease, they automatically attach some range of severity to people living with the disease, but none to people with the sickle cell trait. I, for one, am very passionate about sickle cell awareness and advocacy BUT I must confess my interest is geared more towards people who are carriers, this is why I come after them because I want them to have all the appropriate information so they can make informed decisions. The truth of it is without carriers there is no sickle cell disease, yes I’m well aware warriors too but I’m not worried about warriors as much as I am with carriers. I doubt there are warriors out there risking bringing sickle children, they know the deal and most aren’t willing to see another human being suffer from the hands of SCD. Anyway, I feel strongly within myself that I target my sickle cell awareness/education to everyone but most especially to people with the sickle cell traits for obvious reasons, but also because there are not enough information or knowledge about what it truly means to have sickle cell traits or be genotype AS. Truth of the matter is they are just as impacted as people living with sickle cell, below I share my reasons in no particular order. Truth is, the spectrums of experience with SCD is pretty wide and varies from person to person, and this is also very true for people with genotype AS. Forget what you were told or knew prior, sickle cell trait aka carriers do experience some variation of symptoms that are associated with the disease. Some people with the trait are closer to having full blown SC symptoms than others, but for the most part each and every person with some percentage of sickle trait do manifest some sickle cell symptom. Like sickle cell patients, these symptoms are triggered by stress, overexertion, dehydration, lack of adequate oxygen, etc. These symptoms causes the trait to mimic the disease and could be just as traumatic as the full blown disease. There has been many genotype AS people that have shared wth me and others their experience with sickle cell manifestation in different forms. A mother posted in a SCD group, “My daughter is 23 years old and has shown signs of complications from the trait since she was a young teen. Her S hemoglobin was measured as being as high as 37%. She often complained of severe pain in her legs and fainted from physical exhaustion several times. Last year at 22 years of age she was hospitalized for Sickle Cell trait crisis due to dehydration and pain. People with the trait need education on how to manage their condition. I make her take folic acid supplements and encourage her to drink at least 8 glasses of water a day.” These cases are not isolated, they are actually more common than we realize or admit to, many have died sudden deaths from sickle trait manifestations without much understanding and reasons. I cannot stress enough how important it is to LISTEN TO YOUR BODY! Sickle cell carries can experience these manifestations in the form of episodes of lethargy, weakness, pale, tiredness, muscle spasms, joint pack, back pain, shortness of breath, heart diseases, etc. It has also been known that sickle cell traits can cause epidoses of hematauria – blood in the urine as a result off the kidneys deteriating, AVN of several joints (making it difficult to walk or raise your arms), loss of vision, pneumonia/acute chest and a few other things that have been associated with having full blown sickle cell disease. When the blood starts to sickle, clots can form and those clots are what causes pains; joint, back, muscle, etc. What happens is that there is a decrease in blood flow to organs and tissues, therefore cutting off oxgen supply to them, which by the way can lead to organ/tissue necrosis but I digress. At the same time, decrease of oxygen in red blood cells causes these cells to get sticky that can cause blood clots which in turn turn into DVT or embolism that travels to vital organs like the lungs, heart and brain, causing death. Also, there has been issues noted with those who have the trait and uses inhalers or nebulizers for breathing issues, apparently the medication can deplete potassium in a person making them cramp up and have muscle spasms that mimics sickle cell crisis. It is EXTREMELY important to take care of yourself and know your body. 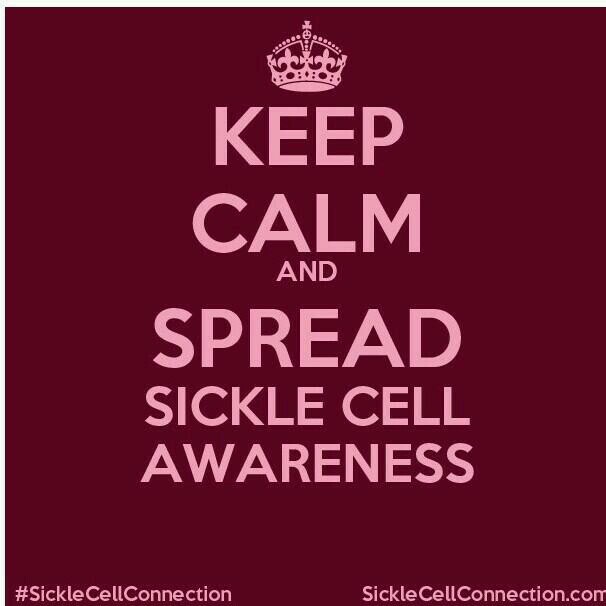 People can, and have died from having sickle cell trait, the need for awareness has never been important than now. Having a doctor who knows your history and has the knowledge of Sickle Cell is crucial, and don’t be afraid to ask your doctors questions. In the meantime, learn your limit, and listen to your body. It is important to keep yourself well hydrated (drinking alcohol causes dehydration), maintain a proper diet as much as you can and if you must exercise, use a routine designed specifically for you so you are not exerting your body. Last but not least be your own advocate. Be proactive about your health and do your researches as much as you can about the disease. Not many medical professionals know enough about sickle cell and the traits, therefore don’t know how to treat it properly or advice those with the traits accordingly. So while it’s great that we understand the importance of knowing our genotype status and that of our partners, it is also incredibly important that we take care of our health. Bottom line, anything with sickle cell; full blown disease or trait, whether it is Thalassemia, Anemia or any of the variations, they should all be just as a great concern and should be taken serious. There are little differences and variations in how they are manifested in each person but at the end of the day it is important to know where you stand on the spectrum, and have proper care that fits you and your symptoms. If you have any questions or comments, please do leave them below.